Way back, in the early days of The Armenian Kitchen’s existence, we’d posted a story about the ARAM sandwich and how it got its name. Many comments later, the facts were revealed. 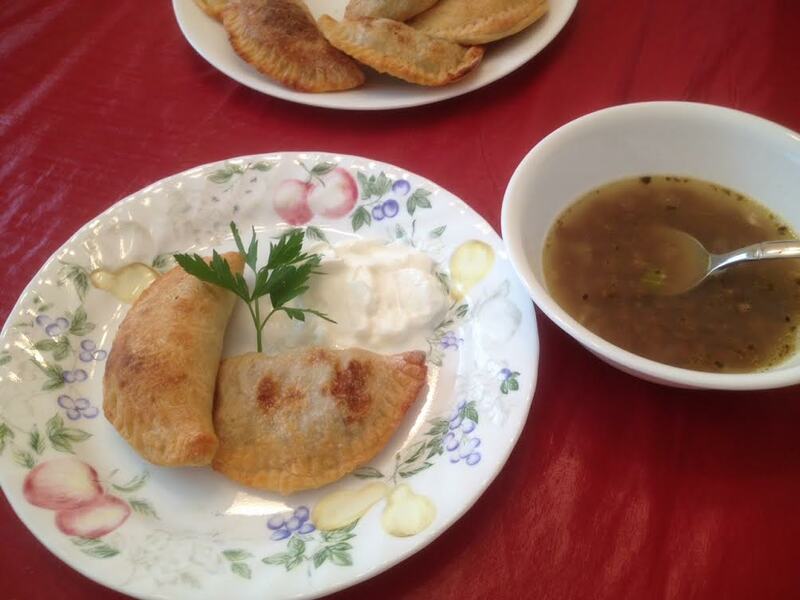 In a recent comment on this story, a reader expressed a love for a dough-encased spicy meat pie that was served at Caravansary, the establishment where the ARAM sandwich was created. I promised the reader I'd post a recipe, but having never been to the Caravansary myself, I am posting one that I hope will qualify and satisfy. 1. Dissolve yeast and sugar in ¼ cup lukewarm water (105-110°F). Allow mixture to proof for about 15 minutes. 2. In a medium bowl, mix together the flour and salt. Make a well in the center and add the oil and proofed yeast mixture. 3. Using a stand mixer fitted with the paddle attachment, slowly add the wet ingredients into the dry, adding the 1 cup and 1 tablespoon of water a little at a time. 5. 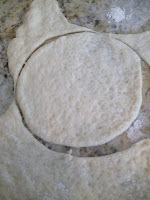 Transfer dough to a large bowl, lightly coating the dough’s surface with olive oil. Cover bowl with plastic wrap and let rise in a warm spot until doubled, about 1 hour. While dough rises, prepare the meat filling. NOTE: If you’re not comfortable making dough from scratch, feel free to use prepared pizza dough, available in most grocery stores. Heat a non-stick skillet on medium-high heat; add oil. Add onions and cook until slightly softened. Add ground meat to the skillet and cook until it is crumbly and no longer pink. Drain any excess fat. Stir in parsley, lemon juice, seasonings and pine nuts; cook another 2 minutes. Taste; adjust seasonings, if necessary. Transfer meat mixture to a bowl; cover and refrigerate until ready to assemble. 1. Preheat the oven to 375°F. Line two heavy baking sheets with parchment paper. 2. Divide the dough into 2 equal parts. Roll half of the dough out on a lightly floured work surface to 1/8-inch thickness. Gently lift the dough from the edges to keep it from sticking to the work surface. 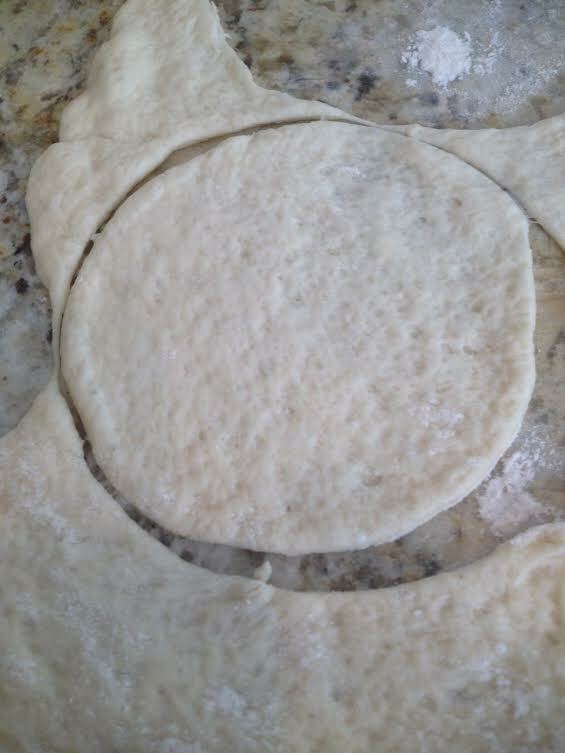 Cut the dough using a 4-inch round biscuit cutter. (I used a plastic lid to create circles since I do not have a 4" biscuit cutter!) Continue this process until all of the dough has been cut. Gather and knead together any scraps of dough. Wrap in plastic. 3. Fill each circle of dough by placing a tablespoon of uncooked meat filling on one side of each. Filling should not touch the edges of the circles. NOTE: The meat filling will cook during the baking process. 4. Fold the empty side of the dough over the meat-filled side to create a half circle. Pinch the edge of the dough firmly to keep them closed. 5. Place the meat pies on the parchment-lined baking sheets and generously brush the surface with olive oil. Bake on the center rack of the oven for 18-20 minutes, or until golden brown. Serve as an appetizer or as a meal with soup and/or salad. 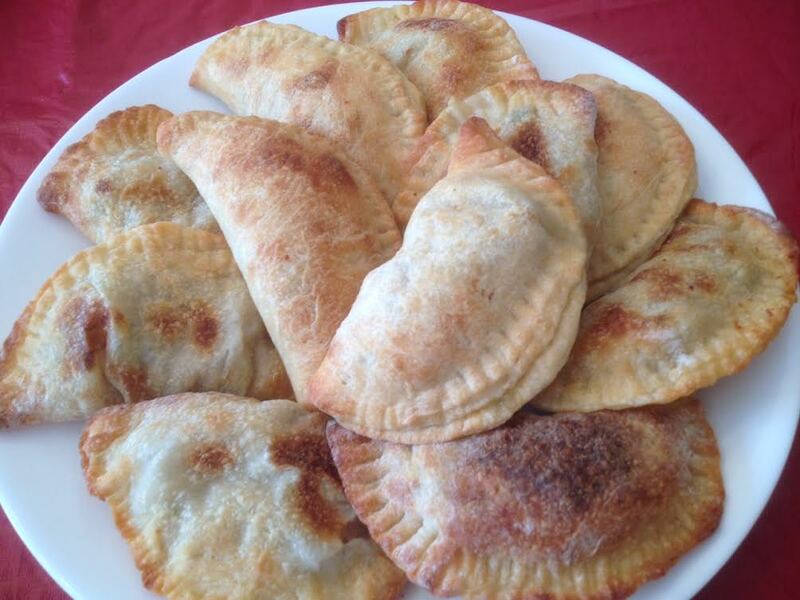 NOTE: The meat pies can be frozen after they are baked and cooled by placing them side-by-side in freezer bags. If you stack them for freezing, be sure to have a layer of plastic wrap in between each layer first. They can be heated from the frozen state.